Second, please check the weight of your TV, it must be less than 40KG/88lbs. Third, please make sure that the distance of the mounting holes (VESA Holes) on the back of your TV is less than 15.7 (400mm)horizontally and 15.7 (400mm)vertically. Furinno Large Entertainment Center is a perfect fits into your modern simple lifestyle. It features the large top panel which holds up to 50-Inch Flat Panel TV. There are open display shelves to hold your entertainment equipment and two compartments with doors for your loose stuff such as CDs, DVDs and games. It is easy to assemble, lightweight and space saving. The manufacturing process complies with the green rules of production. There is no foul smell, durable and the material is the most stable amongst the medium density composite woods. The PVC tubes are made from recycled plastic and is tested for its durability. A simple attitude towards lifestyle is reflected directly on the design of Furinno Furniture, creating a trend of simply nature. All the products are produced and assembled 100-percent in Malaysia with 95% - 100% recycled materials. Care instructions: wipe clean with clean damped cloth. Avoid using harsh chemicals. Pictures are for illustration purpose. All decor items are not included in this offer. Large top panel holds up to 50-Inch flat screen TV. Open shelves and closed compartments are great for display and storage of entertainment equipment. Material: Made from E1 Grade composite wood and PVC tubes. Easy to assemble. Assembly instruction and hardware pack included. Product Dimension: 47.24(W) x 19.53(H) x 15.87(D) Inches. Get simple, savvy storage with the Furinno Turn-N-Tube No Tools Entertainment Center. Sleek, architectural design makes this TV stand striking and functional. 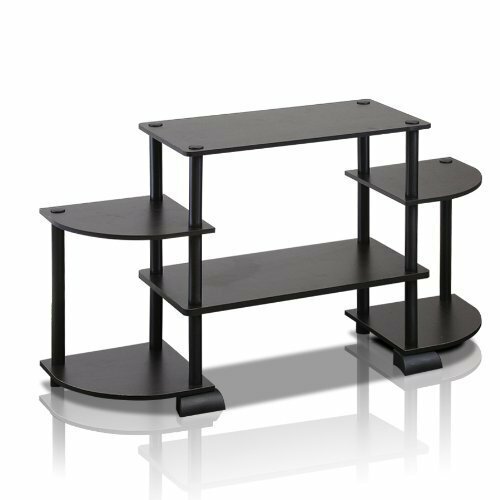 Three open-storage shelves are ideal for organizing electronics or media, and the stand accommodates TVs up to 47 inches wide. No-tools assembly means anyone can build this stand in a flash. This stand is as smart as it is functional thanks to its primarily recycled-material construction. Stylish and unfussy, this stand is an ideal storage solution for any living room or den. Dimensions: 43.8W x 11.7D x 16.2H in.. Holds most TV screens up to 47 in. wide. Wood composite construction. Choose from available finishes. Recommended max. weight 60lbs.. 2 open shelves. Made from 95%-100% recycled products. Easy wipe-clean care. Tool-free assembly. Dimensions: 43.8W x 11.7D x 16.2H in. Make a striking, modern statement with the Furinno Turn-S-Tube Wide TV Entertainment Center. Three open-storage shelves are ideal for storing electronics or media, and the stand accommodates TVs up to 47 inches wide. Made of 95% to 100% recycled materials, this table is a smart choice, too. Its attractive, architectural design adds refinement to any living room or den. Dimensions: 47.25W x 13.4D x 15.9H in.. Holds most TV screens up to 47 in. wide. Wood composite construction. Choose from available finishes. Can withstand heavy weight. 2 open shelves. Made from 90%-95% recycled products. Easy wipe-clean care. Assembly required. Dimensions: 47.25W x 13.4D x 15.9H in. This universal tv stand looks simple, elegant and won't take a lot of sapce. 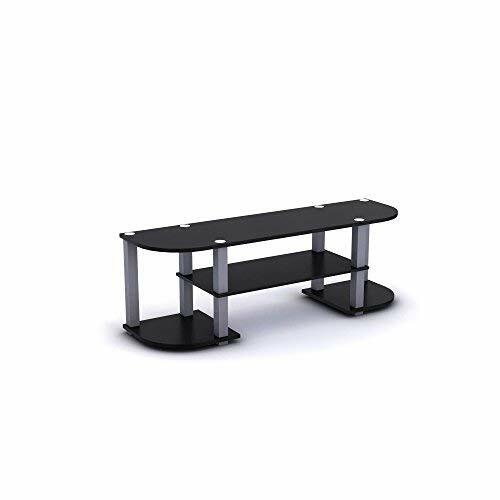 It is a conbination of shelf and mount, what's more, The mount can Swivel +/-40 , make you have a perfect view.This Universal TV Stand is your solution. It's small space size make it perfect for TV and can still hold your components and DVDs! 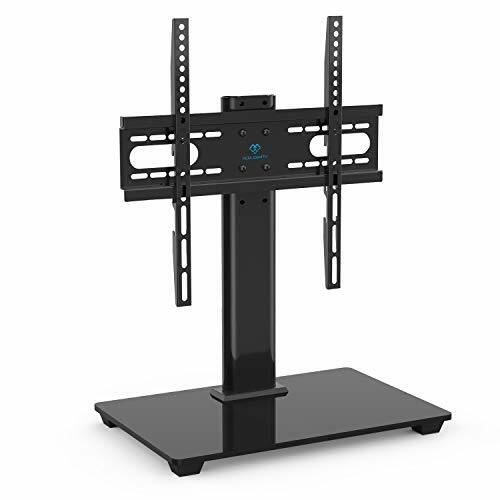 The included mount holds up to a 65" TV and hides all your cords down the back panel. 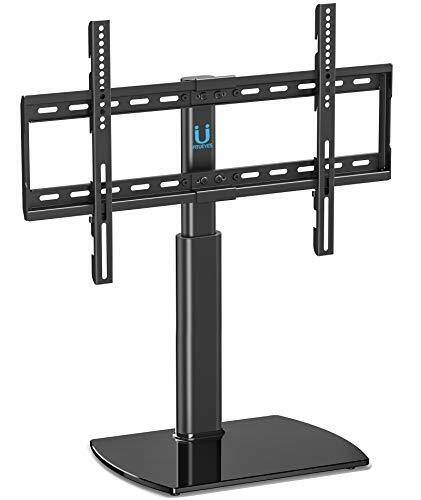 ADJUSTABLE TELEVISION HOLDER STAND-Shelf width 13inch, mount Max. depth 27.5 .The rack has three different heights can be adjusted 26.2/28.5/30.9.This unit weight is at just 15pounds. The Wrangler is a beautiful piece of furniture that speaks to today's designer trends of farmhouse and cottage inspired decor. 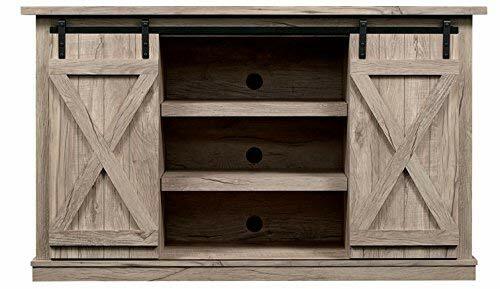 For added appeal, barn-door inspired cabinets feature "X" styled mullions that give visual interest to the door fronts. Fixed to a metal rail system, each door slides to conceal and reveal the contents of the cabinet. For all your media needs, the Wrangler offers 3 open shelves for your cable box or DVD player, as well as two side cabinets that feature adjustable shelves for additional storage. 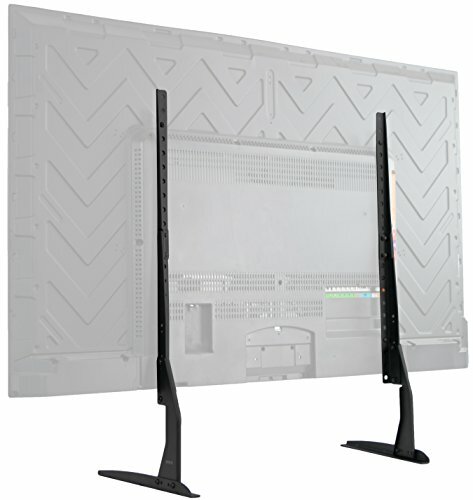 The Wrangler cabinet easily accommodates televisions up to 60" in size or 75 lbs. Alternatively, the Wrangler is also perfect as a hall or accent table. 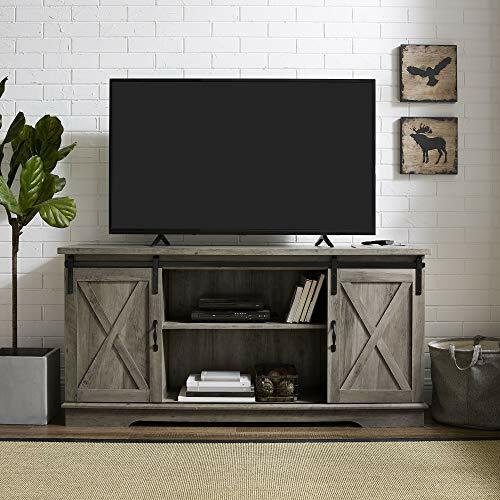 This TV stand will give your living room a charming country feel, while also providing plenty of storage space for your electronics and d cor. Featuring two sliding barn door styled cabinet fronts for a versatile design where you can either close off the middle or both sides, depending on your needs. Adjustable shelving and cable management make it simple for you to keep your electronics in one place. Web exclusive! 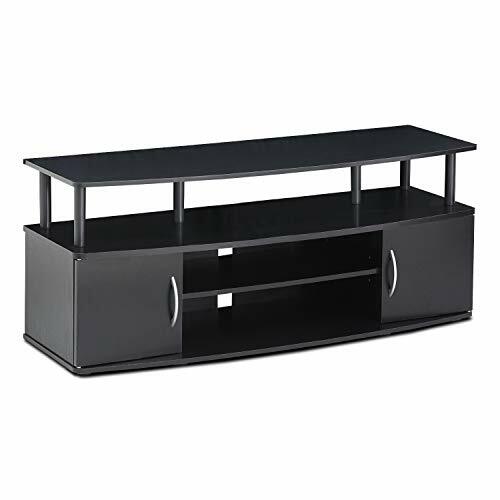 The W.Designs 70" Essentials TV Stand is the perfect blend of style and functionality. Adjustable shelving offers plenty of space for media components and decorative pieces, while a cable management system helps you maintain a tidy entertaining area. 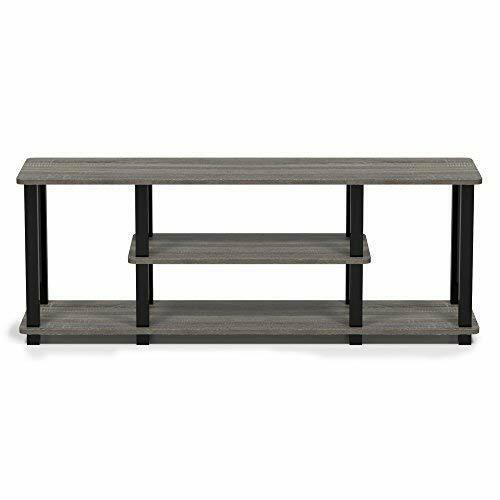 This stand will accommodate most flat-panel TVs up to 70" for added convenience and its rich, textured finish brings a designer look into the room. Get simple, savvy storage with the Furinno Turn-N-Tube No Tools Entertainment Center. Five spacious open-storage shelves are ideal for organizing electronics or media, and the stand accommodates TVs up to 37 inches wide. No-tools assembly means anyone can build this stand in a flash. This stand is as smart as it is functional thanks to its primarily recycled-material construction. 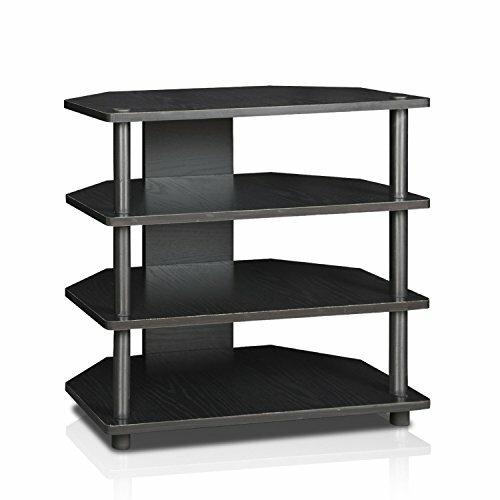 Stylish and unfussy, this stand is an ideal storage solution for any living room or den. Dimensions: 41.5W x 11.6D x 22.85H in.. Holds most TV screens up to 37 in. wide. Wood composite construction. Choose from available finishes. Can withstand heavy weights. 3 open shelves. Made from 95%-100% recycled products. Easy wipe-clean care. Tool-free assembly. Dimensions: 41.5W x 11.6D x 22.85H in. Brand: Convenience Concepts, Inc. | Manufacturer: Convenience Concepts, Inc.
Keep things simple with the Furinno Just No Tools Mid TV Stand. Ample open-storage space is ideal for organizing electronics or media, and the stand accommodates TVs up to 31 inches wide. No-tools assembly means anyone can build this stand in a flash. This stand is as smart as it is functional thanks to its primarily recycled-material construction. 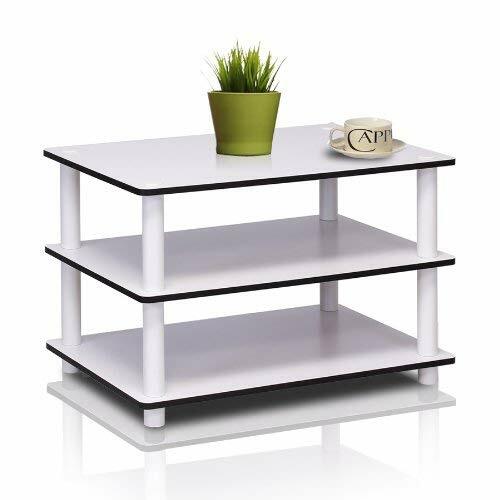 Modern and minimal, this stand is an ideal storage solution for any living room or den. Dimensions: 31.5W x 15.6D x 10.9H in.. Holds most TV screens up to 31 in. wide. Wood composite construction. Choose from available finishes. Recommended max. weight 40 lbs.. 1 open shelf. Made from 95%-100% recycled products. Easy wipe-clean care. Tool-free assembly. Sturdy on flat surface 5-minutes no tools no hassles assembly. 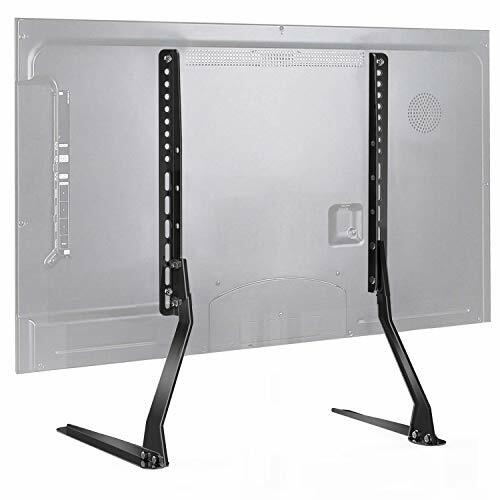 Compatibility & Sturdy - fits flat screens from 37" To 70" In size with Mounting holes between 100mm x 100mm and 600mm x 400mm and hold up to 110 lbs. 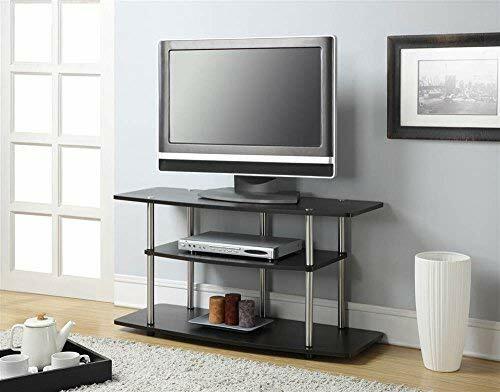 Furinno Turn-N-Tube Easy Assembly 4-Tier Petite TV Stand features (1) Unique Structure: Open display shelves provide easy storage and display of TV and other entertainment accessories. Suitable for any rooms. Designed to meet the demand of low cost but durable and efficient furniture. It is proven to be the most popular RTA furniture due to its functionality, price, and the no hassle assembly. (2) Smart Design: Easy Assembly and No tools required. A smart design that uses durable recycled PVC tubes and engineered medium density composite wood that withstand heavy weight. Just repeat the twist, turn and stack mechanism, and the whole unit can be assembled within 10 minutes. Experience the fun of D-I-Y even with your kids. (3) The E1 Grade medium density composite wood is manufactured in Malaysia and comply with the green rules of production. There is no foul smell, durable and the material is the most stable amongst the particle boards. The PVC tube is made from recycled plastic and is tested for its durability. A simple attitude towards lifestyle is reflected directly on the design of Furinno Furniture, creating a trend of simply nature. All the products are produced and assembled 100-percent in Malaysia with 95% - 100% recycled materials. Care instructions: wipe clean with clean damped cloth. Avoid using harsh chemicals. Pictures are for illustration purpose. All decor items are not included in this offer.